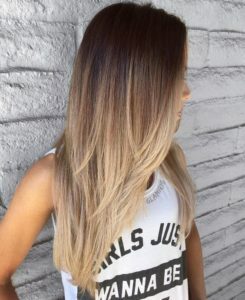 In the past few years, the balayage style has overtaken the ombre, as the most popular dyed hairstyle. 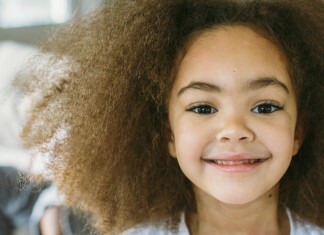 It is a French hair colouring technique, which involves painting colour on the hair by hand, to achieve a more natural and carefree effect. 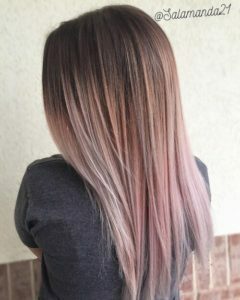 This free-hand technique of applying hair dye creates a contemporary effect, which can incorporate numerous tones to create a natural transition between colours. You can choose a natural colour palette, or go for the ever popular pastel or neon hues. When applied to straight hair, balayage can create depth and texture to thinner hair, and definition of layers and lightness to thick hair. 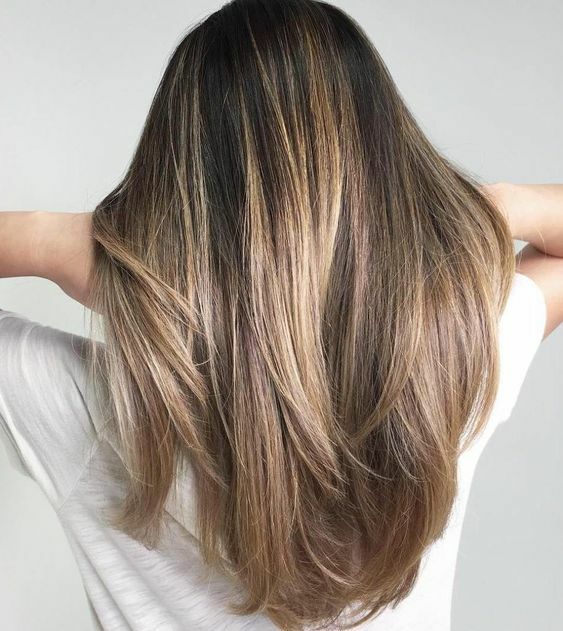 So, if you are considering opting for a custom balayage hairstyle, take inspiration from our gallery of varied and stunning looks. A rich brunette tone has been brightened with honey blonde and icy blonde highlights through the lengths to create a sun-kissed balayage effect. The long layers take some weight out of the thick hair, giving this beautiful hair an airy and weightless feel. 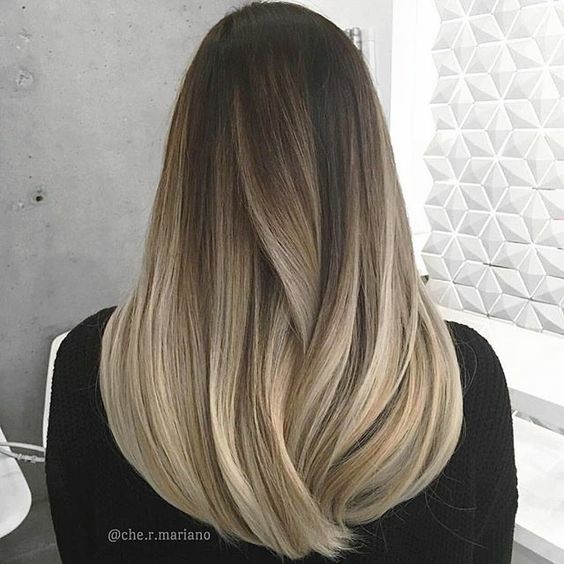 There are no rules limiting balayage to natural hair colours. 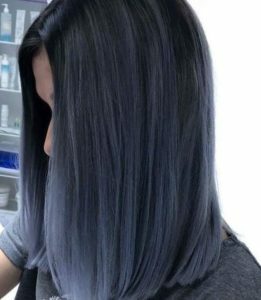 This indigo-denim blue hair looks extra stunning with the addition of light blue highlights concentrated towards the ends. 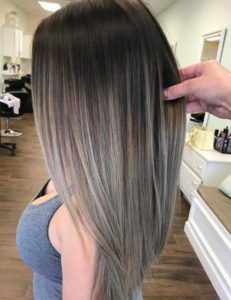 Such a winning balayage look. 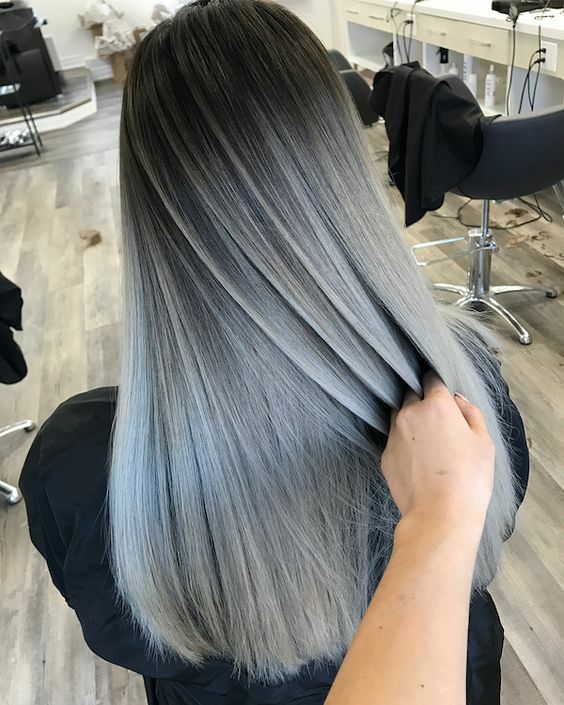 Grey and silver tones remain as popular as ever, and with this beautiful balayage it is not hard to see why. 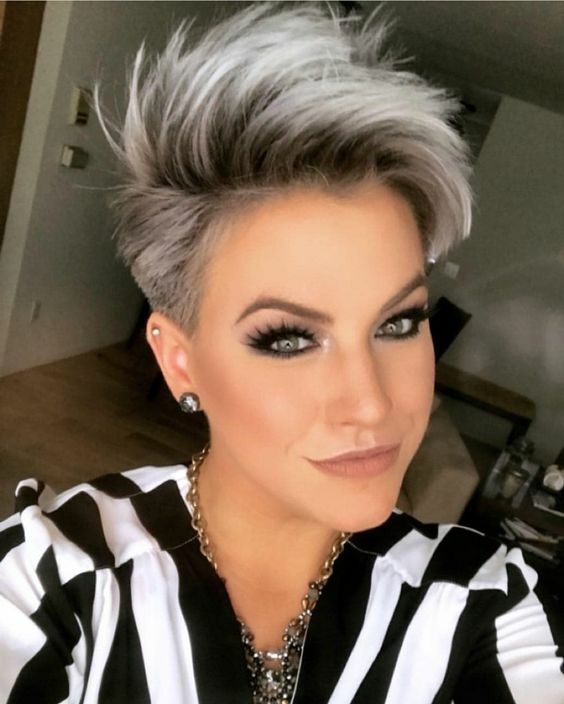 The high contrast between dark brown and grey has been expertly blended by adding in subtle ash blonde, silver, and multiple tones of grey. It gives this beautiful straight hair texture and depth without having to curl or style. 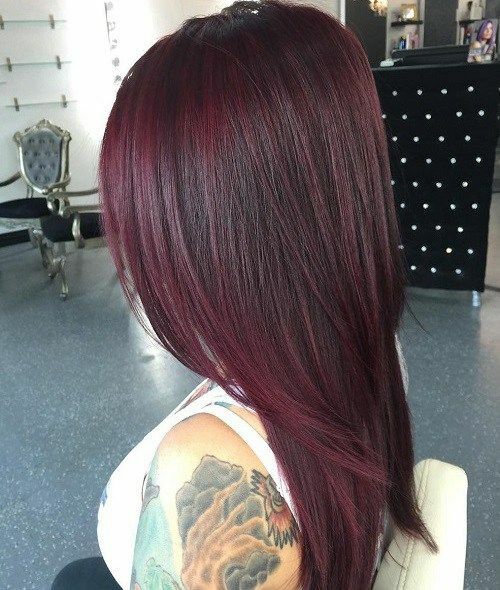 The reddish tones of a mahogany hair colour is a great way to add some extra shine and silkiness to straight locks. 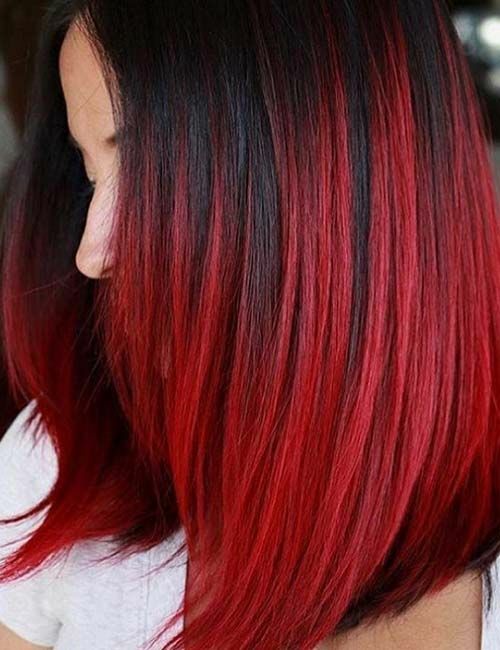 A few cherry highlights around the hairline and through the lengths lifts the gorgeous mahogany shade to another level, for a subtle yet beautiful balayage look. This chocolate lob is given depth with the addition of subtle yet striking caramel highlights. Straight hair can sometimes give highlights a harsh, jarring effect, but these delicate caramel highlights in a few tones, really warms up the cool brown, without being over-powering. 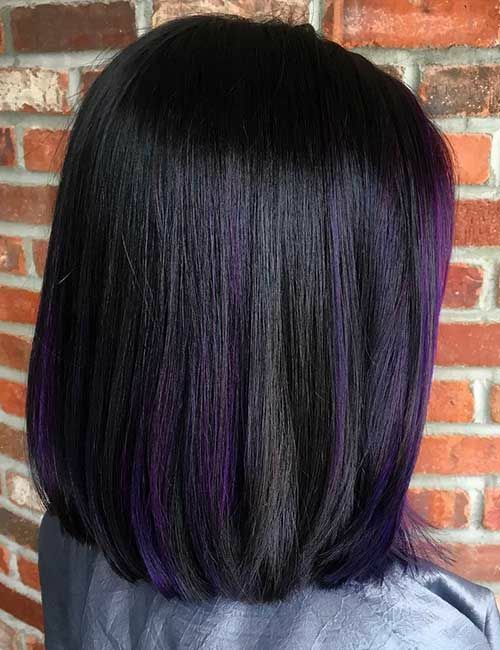 This glossy black bob has been given a touch of the Gothic with a delicate purple balayage. This hint of colour gives some depth to the solid black, almost creating the illusion of movement. Stunning. 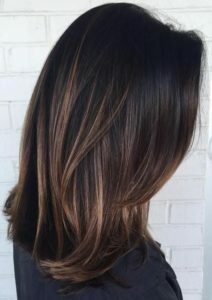 Both cool and warm tones of brunette will make for a perfect balayage style when the right tones are used. This cooler tone of brown is perfectly complemented with multiple lighter shades, including ash blonde and icy blond. It gives great depth to thicker, straight hair that can lack definition. 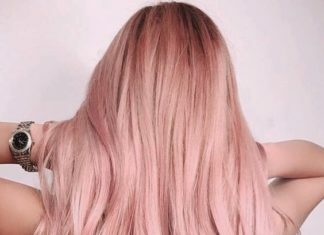 The popularity of pastel hair colours shows no sign of slowing down, which has resulted in some fabulous balayage looks in a combination of the two trends. 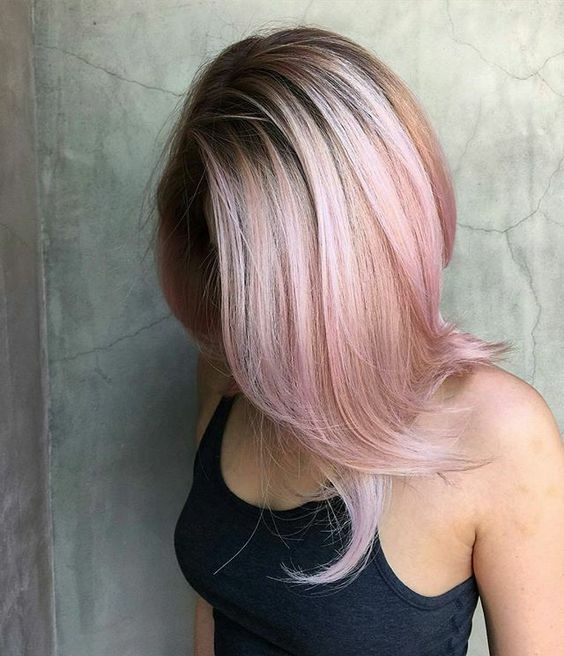 Dark roots are blended into pastel pink ends, with light blonde highlights emphasising the flicked out style. An ashy brown layered lob with white and platinum ends looks absolutely stunning. This balayage for straight hair will work on all skin tones but will look especially magical on those with olive skin. Auburn makes for a stunning base colour for a rose gold balayage. This beautiful effect is created with the delicate hand-painting or pastel pink, rose gold, and honey blonde tones. 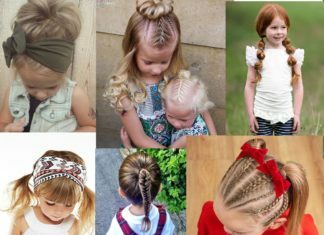 The lighter tips of this hair have a wonderful array of colours, yet still looks completely natural. 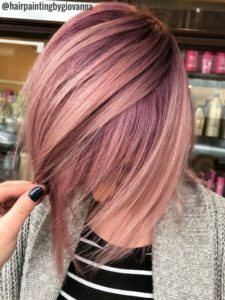 Balayage does not always have to be subtle, you can take a bolder approach like in this choppy brunette bob with stunning lavender highlights. 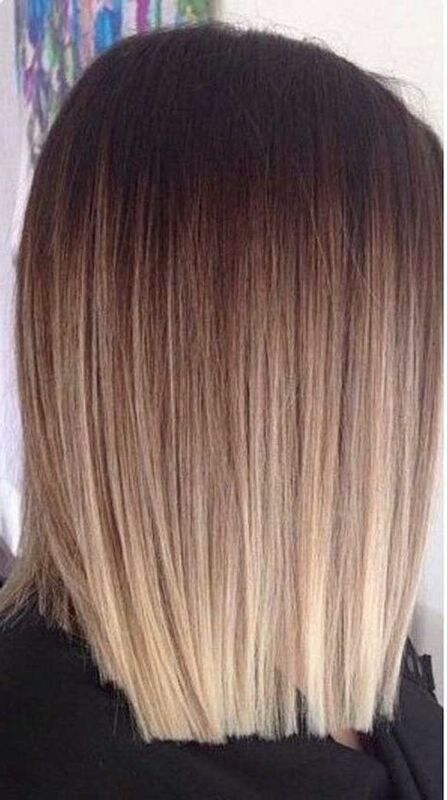 The brighter highlights against the dark base and a messy blow dry creates plenty of texture thicken up thinner hair. 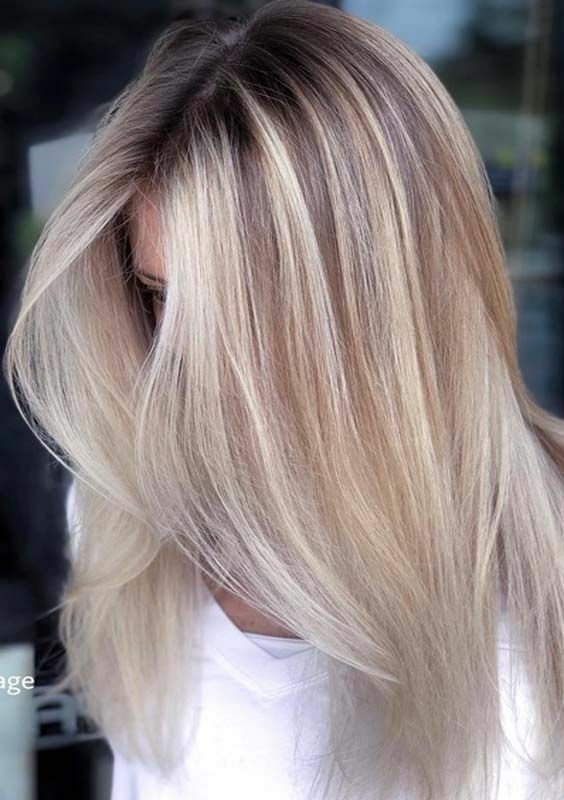 This long and luscious light brown hair has been given an icy blonde balayage for the perfect surfer girl chic. 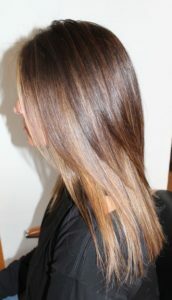 A few honey blonde highlights add a touch of warmth as well as emphasising the beautiful condition of these long locks. 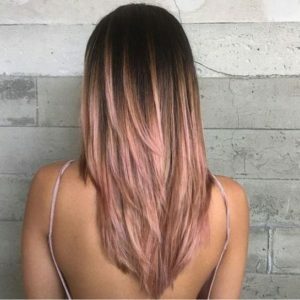 Balayage looks are not limited to longer hairstyles. This pixie crop features a cool and contemporary mix of silver, white, and grey tones on a dark grey base. 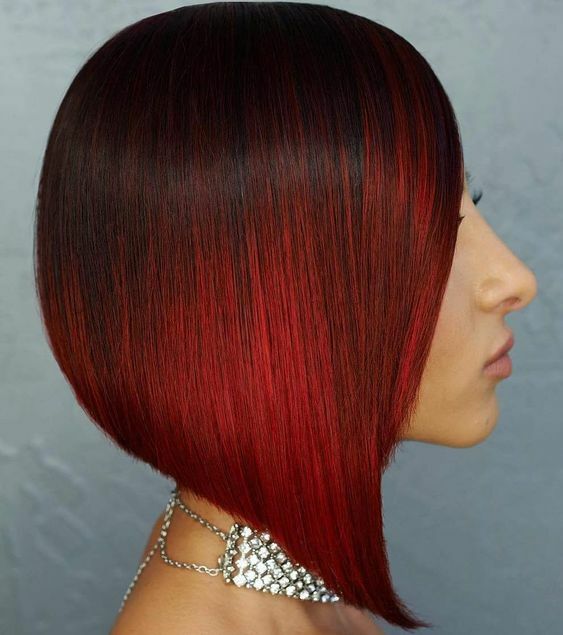 The shorn side and asymmetric cut are edgy and perfectly complement the model’s elfin features. The long layers of this chestnut brown hair reveal striking underlights in caramel tones to create a unique balayage effect. A very sleek style that will work on all face shapes. A dark grey base colour is made magical with a beautiful icy blue balayage. Multiple cool shades have been expertly pained onto the hair to create a style that is otherworldly. These cool colours will be perfect for winter, don’t you think? 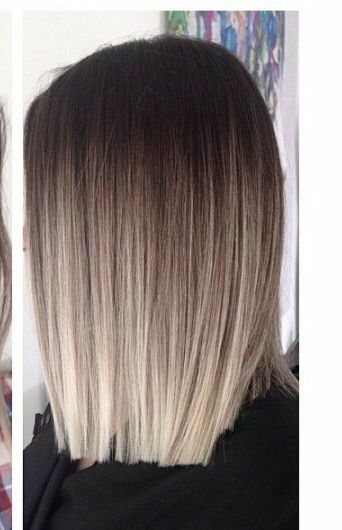 The blunt edge of this straight lob is accentuated by the white blonde at the tips. The thin, straight hair is given the illusion of texture and thickness thanks to multiple tones of blonde through an ash brown base. 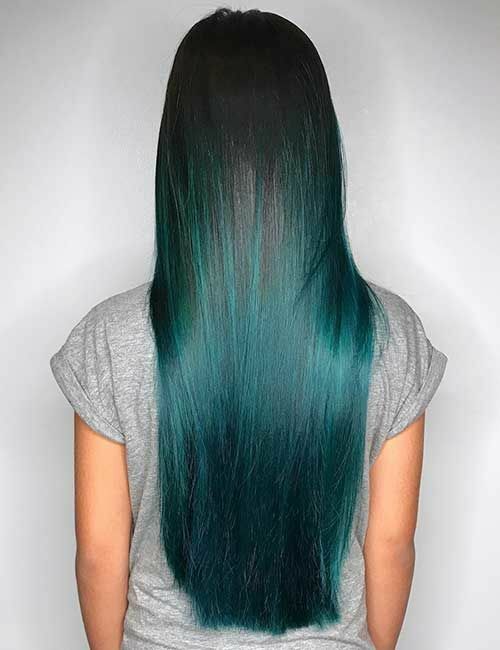 For a bolder straight hair balayage, choose a statement colour story. This dark chocolate and cherry red balayage has plenty of impact thanks to strong contrasting colours. 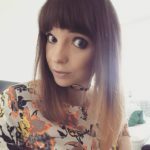 Blorange is one of the hottest hair colours of 2018 and its subtle addition adds just the right amount of warmth to this cool ash brown hair. Long layers have been emphasised with icy blonde tones and blorange highlights feature through the lengths. 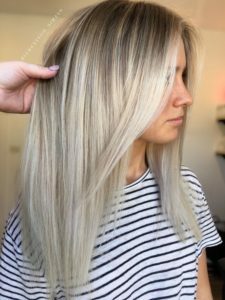 The dirty blonde base of this straight lob is given all the warmth it needs with strands of ice blonde, caramel, and honey blond. 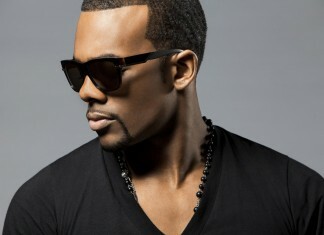 The wispy bangs around the hairline give a laid-back appeal, for an overall look that is effortless. 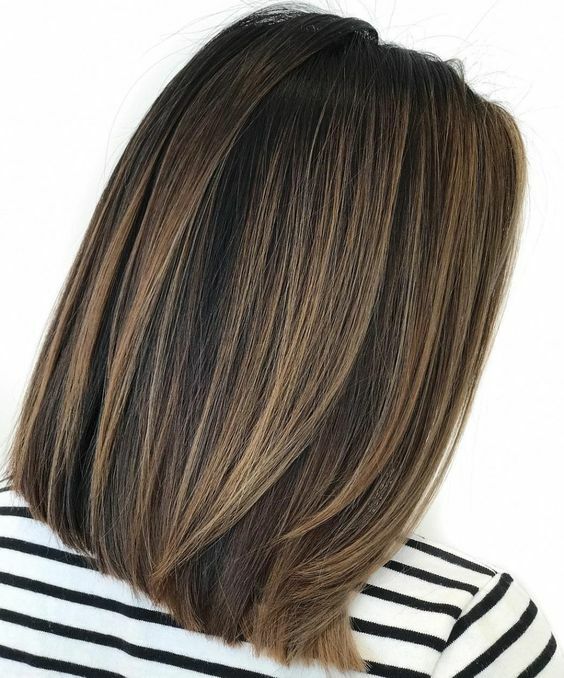 There is so much life and texture in this choppy bob, which has a chocolate brown base and bleached blonde highlights. 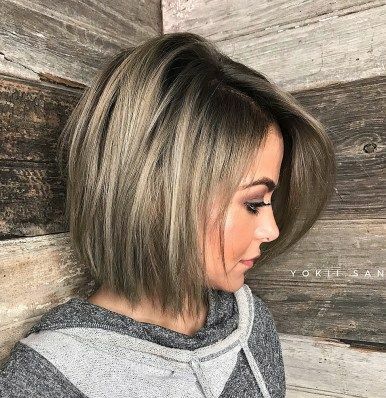 The choppy layers add great depth to the short, and straight style, and the multiple blonde tones give a sun-bleached effect, that will look like you have stepped straight off the beach, no matter the season. This super sleek asymmetric bob has an incredibly rich dark brown base that has been elevated with the addition of highlights in multiple colourful shades. 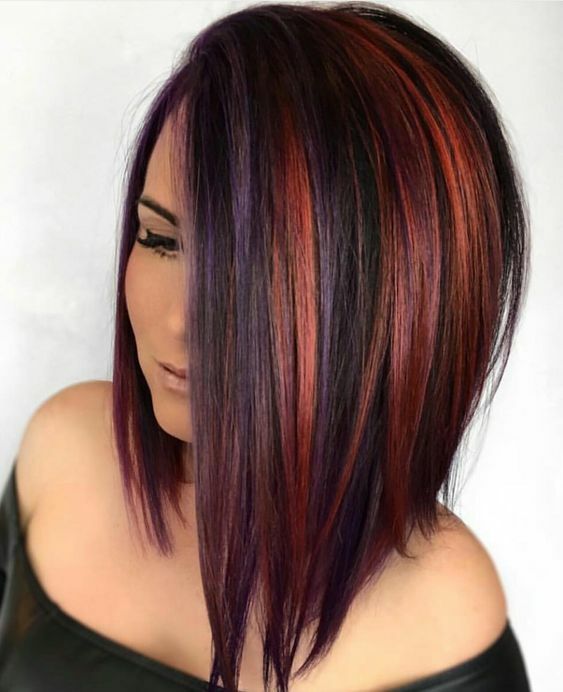 Toned of violet, blorange, red, and magenta have been expertly applied to create a beautiful coloured style, that still has some subtlety. 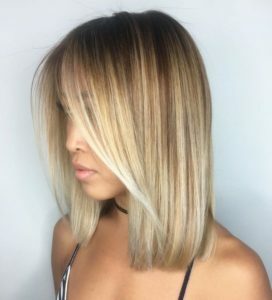 Balayage effect can even be created on the shortest of straight hair. 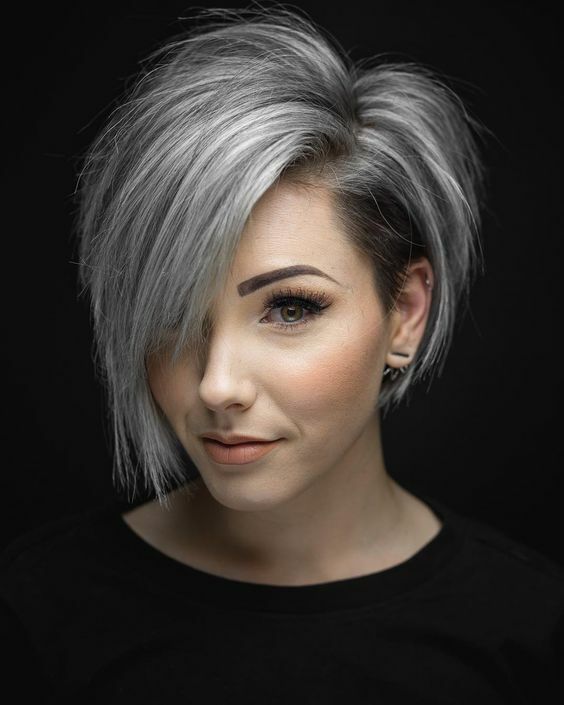 Just take a look at this stunning cropped hairstyle with its edgy shorn side and quiffed bangs. The ashy grey base gives way to silver and white tips, which really complements the model’s skin tone, and makes her eyes pop. 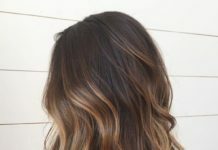 Even the most subtle of balayage looks can make a big impression. The layers of this lob are so well defined thanks to some delicate golden brown highlights. Transform your long locks into those of a mermaid with a stunning black base colour and a balayage of marine greens and blues. A good quality hair shine spray will ensure that your ‘under the sea’ locks are always super glossy and soft. 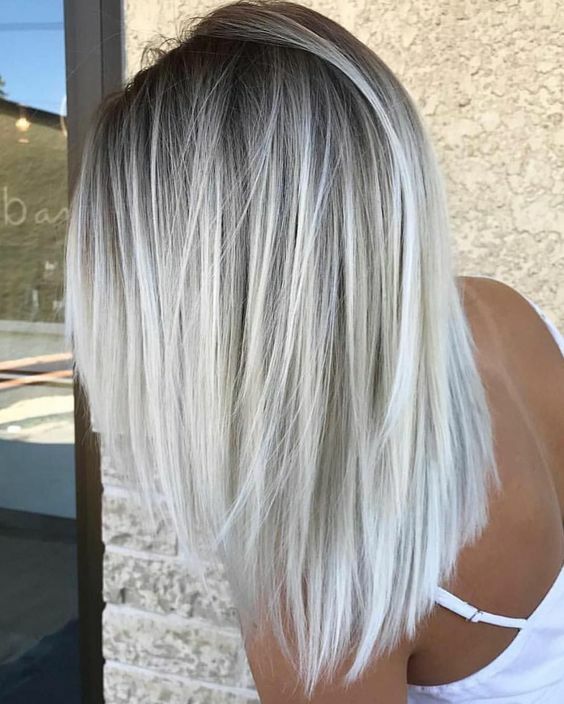 This natural ash blonde base has been given a stunning sun-kissed effect with bleached blonde and golden blonde highlights. A concentration of lighter tones around the face will brighten up the skin, whilst accentuating soft layering. This super sleek, rounded bob with a v-shaped cut has a stunning dark chocolate base, which has been amplified with a contrasting cherry-red balayage. So chic. 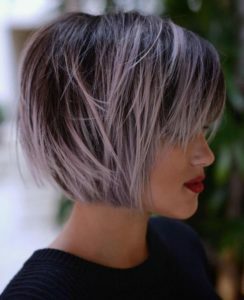 The beautiful natural texture of this thick hair is shown at its best by being cut into a messy bob with razored layers. Slices of honey blonde through the side-swept bangs and the lengths give a relaxed and youthful feel. The lavender base colour of this layered bob has been given a lively touch with the addition on a dusky pink balayage. The darkened roots give the perfect contrast so that each tone of pink used is well-defined. 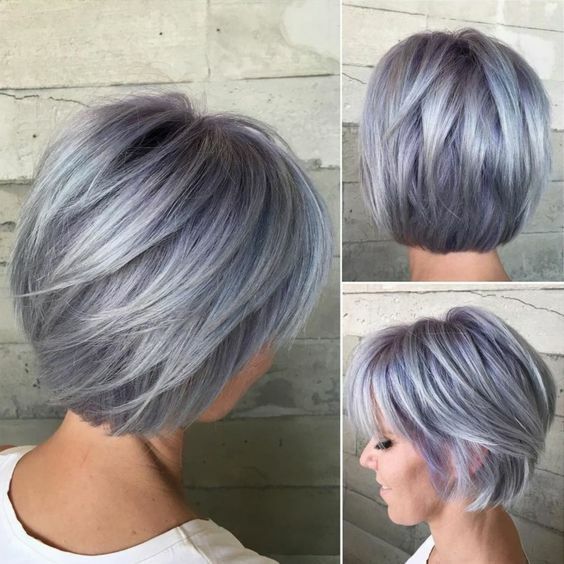 A few lilac highlights prevent the lavender from getting lost amongst the other strong colours. 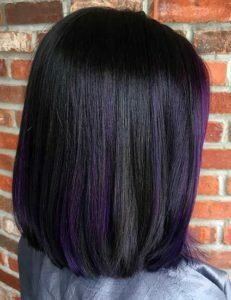 The midnight blue base tone of this graduated bob is so elegant and chic it would be stunning enough on its own. 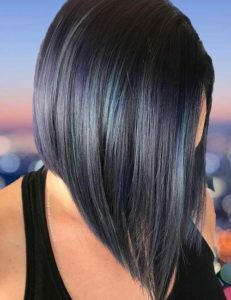 However, it has been taken to a new level with the addition on denim blue and lavender purple streaks to give a balayage effect that is just incredible. 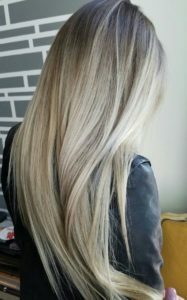 This Rapunzel-like hair is prevented from looking too flat and weighty with the addition of multiple icy blonde and golden blonde tones through the lengths from an ash blonde base. This ombre blonde balayage is so chic! The stunning mushroom base color gradually fades into lighter and lighter blonde shade. A stylish bob cut like this one looks great with balayage highlights! The darker roots and bright makeup give great contrast. If you’d like to have a more natural balayage look, you can take a subtler approach like lob with gorgeous blonde highlights. The mix of silver and purple looks perfect in this short cut with a mix of both colors on a dark base. 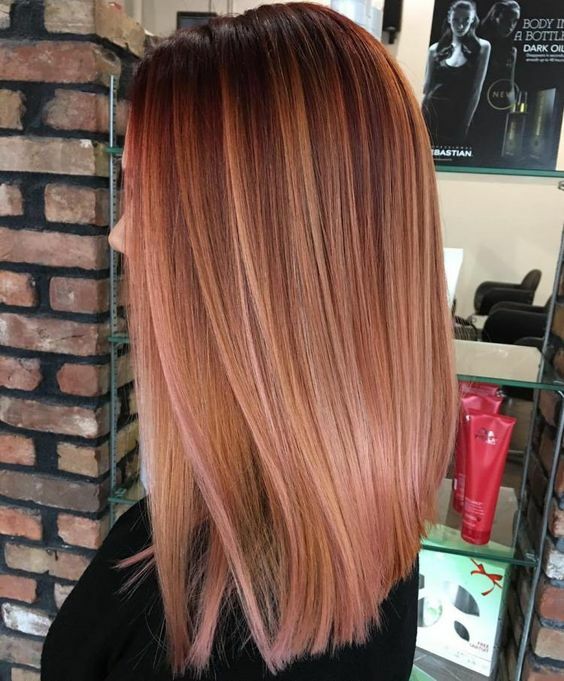 Another stunning rose gold balayage look with a brown base that gets lighter gradually into blonde and rose gold shades.